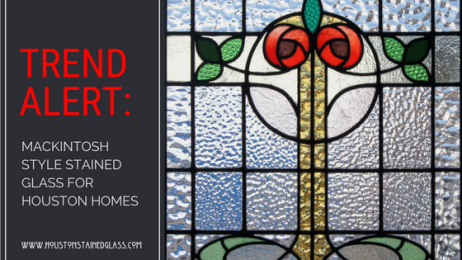 Will Mackintosh Inspired Stained Glass Work With The Design Of Your Houston Home? As a designer Charles Mackintosh was prolific. Part of what draws people to his work is the supreme minimalism that characterizes it. Stained glass windows inspired by his work often include clean lines, bold pops of color surrounded by clear geometric panes and natural motifs. The Mackintosh rose is by far his crowning achievement. Beautiful, elegant and floral, without ever coming across flowery, it is a stunning motif achieved with very few lines superbly placed. Look at the example below to see it’s genius! You can probably see the universal appeal of Mackintosh stained glass just by the pictures above. His body of work is still stunning and somehow as relevant today as it was over 100 years ago. 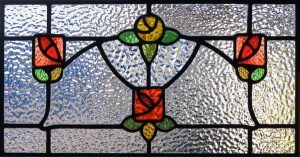 Having this style of stained glass in your home will add modern beauty but still a sense of nostalgia to your interior design. 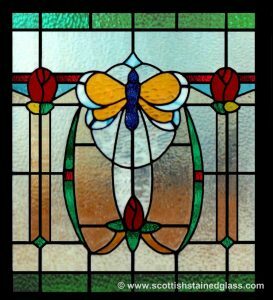 At Houston Stained Glass we specialize in vintage styles of stained glass-like Mackintosh and are highly skilled at bringing older styles to life in modern homes and would love to do so for you. When looking for custom stained glass like this or any style, contact us for more information and to schedule a design consultation.